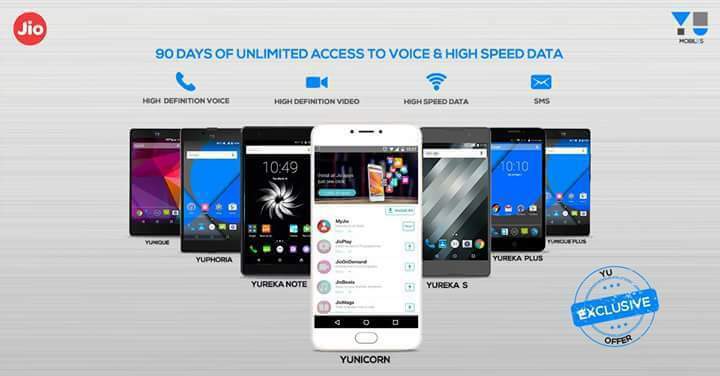 After Samsung and LG and lately, ASUS and Panasonic devices were added to the list of devices eligible for the Jio Preview Offer under which users could get three months of unlimited usage for voice, data and SMS, now YU and Micromax, which is the parent company has also joined to bring the 4G revolution. Now all 4G LTE-enabled Micromax and Yu phone users are now eligible to get a free Jio SIM and avail free unlimited access to HD voice call, HD video call, apps, data, and SMS, so basically the Jio Preview Offer is rolling out to all. Under the Preview offer, consumers who purchase a Micromax 4G smartphone will get a free Reliance Jio 4G SIM and get access to unlimited HD voice, video calling, unlimited SMS, unlimited high-speed data services, along with access to Jio Apps, which Micromax disclosed in a press statement. But, existing users can get their free Jio SIM by generating the Jio Preview Offer code on their phones using the My Jio app. The same procedure will be followed in case of YU as well, as it is a subsidiary brand of Micromax. “As a new age brand, we have been future ready and have introduced all phones that are 4G compatible. With this preview offer our consumers will be able to enjoy the 4G benefits like never before.” Shubhodip Pal, COO, YU Televentures said. So basically, the day is not far when we will see Jio rolling out to every single 4G LTE enabled smartphone. Till then, stay tuned for more news and updates and also, don’t forget to join us on Facebook. If you are gonna avail the offer, let us know about your experience in the form of feedback in the comments section below. Micromax Dual 5 – Another re-branded phone with some minor changes? Can Indian Mobile Phone Makers Ever Be In The Top Position in terms of Market Share & Sales?